In November–December 2015, a salvage excavation was conducted at ‘En ‘Ami’el (Permit No. A-7552; map ref. 213021–82/734492–607; Fig. 1) following damage to antiquities caused during the instalment of a water pipeline along the route of Highway 77 and through Moshav Sede Ya‘aqov. The excavation, undertaken on behalf of the Antiquities Authority and financed by the Netivei Israel Company, was directed by N. Feig (field photography), with the assistance of Y. Yaakobi (administration), M. Kahan (surveying and drafting), N. Zak (plans), H. Tahan-Rosen (finds drawing) and laborers from Nazareth. The excavated area lies on the northeast fringes of ‘En ‘Ami’el. The site was surveyed in the past, when remains of a farmhouse were identified below the Bet She‘arim hills and to their east (Raban 1982: Site 32). Potsherds collected in the survey were dated to the Roman and Byzantine periods, and the flint implements are probably to the Neolithic period. To the east of the ruins lies ‘En ‘Ami’el, a complex of springs and wells east of Road 722 and south of Road 75. A survey conducted by Oshri recovered pottery from the Early and Middle Bronze Ages and the Persian period (pers. comm. ; Site File No. 33619/0, IAA Archives). 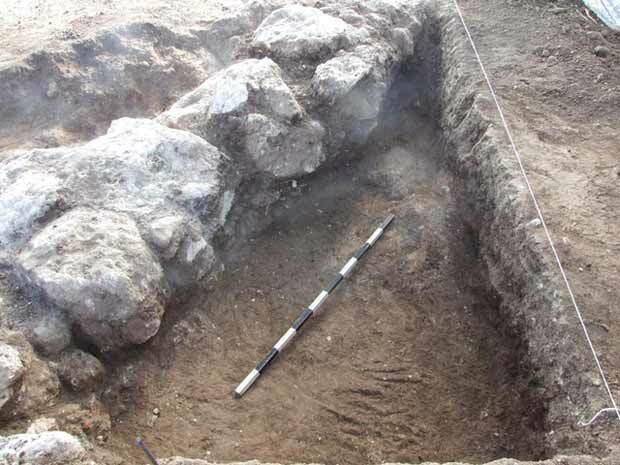 Two excavation squares were opened, one on each side of an east–west trench (length 9–10 m, width 6–7 m) dug prior to the instalment of the new pipe (Fig. 2). 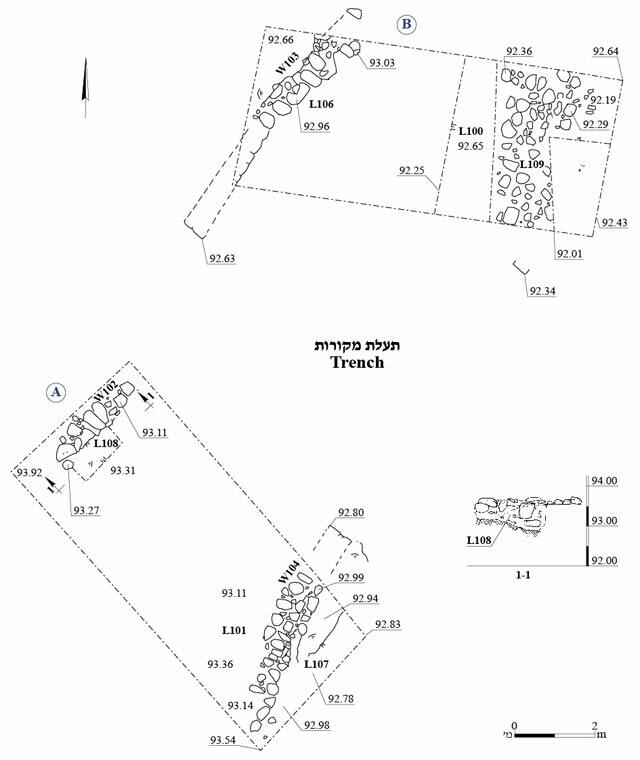 As walls remains were detected in the northern and southern sections of the trench, their continuation was examined. The walls were built directly on the bedrock, and a concentration of Late Roman and Byzantine potsherds was found beside them. Square A (L101). A wall that was clearly visible in the southern section of the trench was unearthed in the east part of the square. The wall (W104; length 4.25 m, width 1.1 m; Fig. 3), preserved to a height of two courses, was built on the bedrock and was probably part of a building. A habitation level (L107) southeast of W104 yielded fragments of Late Roman and early Byzantine pottery. A wall (W102; length 3.2 m, width 0.85 m; Fig. 4), built of a row of large stones and similarly founded on the bedrock and preserved to a height of two courses, was unearthed at the northwest edge of the square. One of the stones in the lower course is an ashlar, possibly in secondary use. It is unclear whether the wall belonged to a building or a boundary wall. Pottery from the Roman and Byzantine periods was recovered from the base of the wall. Square B. A wall (W103; length 6.00 m, width 0.85 m; Fig. 5), visible in the southern section of the trench and preserved to the height of two courses, was also built of a row of large stones. Its construction was identical to that of W102, but it was unclear whether the two walls were associated in any way. 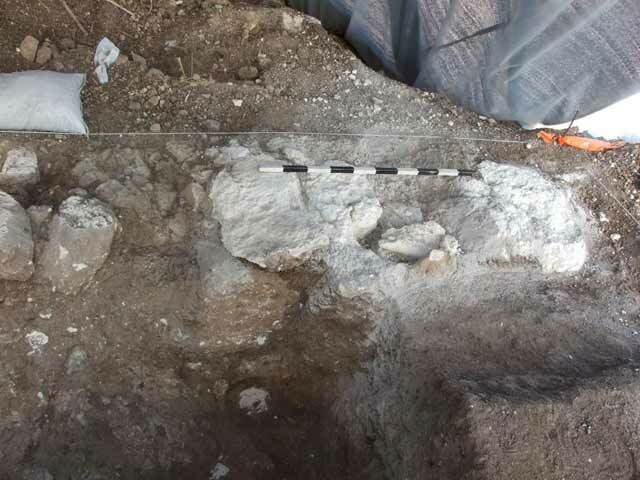 Wall 103 seems to have been founded on the bedrock, which was exposed to the its east (L106). The potsherds found in the fill covering this part of the bedrock (L106) date from the Roman period (late second–early fourth century CE). 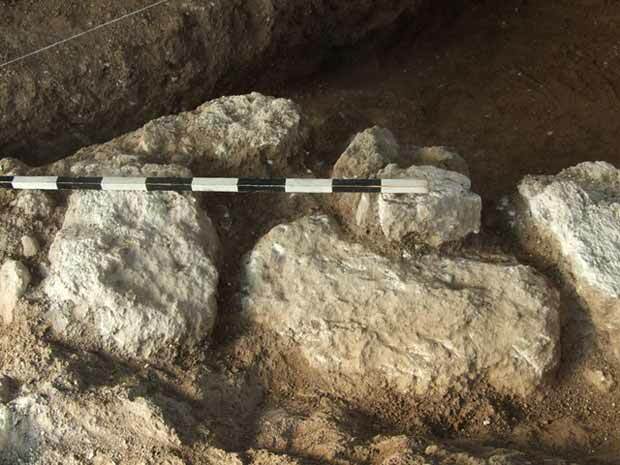 Three rows of stones oriented in an east–west direction on a south-facing slope (L109), possibly belonging to a terrace or some other agricultural structure, were uncovered in the east of the square (Fig. 6). A handful of Roman potsherds was retrieved. Two distinct pottery assemblages are evident. An earlier assemblage, found in Fill 106 at the base of W103, is dated to the Roman period and includes bowls, cooking pots, one jar and a lid. One bowl (Fig. 7:1), from the mid-third–mid-fourth century CE, is similar in form to Kefar Hananya Type E1 bowls, although on further examination does not appear to have been produced at the Kefar Hananya workshop. Two bowls (Figs. 7:2, 3) with flaring and inward-folded rims belong to a type characterized by a round base and three–four handles that appeared in the second–early fourth century CE. Similar bowls were found at Zippori (Balouka 2013: Fig. 23:1–3), where they predate hooked-rim casseroles, which are characteristic of the Byzantine period. Two cooking pots with a grooved, flaring rim fit for a lid (Fig. 7:4, 5) are characteristic of the Late Roman period (fourth century CE). At Jalame they were dated to 351–383 CE (Johnson 1988:195, Fig. 7-39, Form 10). A small cooking pot (Fig. 7:6) with a folded rim is uncommon in northern sites, but is found at Zippori and at Kefar Nahum, and dates from the second–third centuries CE (Balouka 2013:26, Fig. 15:5–9; Loffreda 2008:182–183, DG 167:1–12, Tipo PENT 7). The only jar recovered from the excavation (Fig. 7:7) has a triangular rim characteristic of bag-shaped jars, such as those discovered at Jalame and at Kefar Nahum, where they were dated to the third–fourth centuries CE (Johnson 1988:214–215, Fig. 7-51:772; Loffreda 2008:125–126, DG 77:1–25, Tipo ANF 12). Also found was a bell-shaped lid (Fig. 7:8) used for covering amphoras or jars, with no distinct chronological ascription. Such lids have a variety of shapes and date from the third–mid-fourth centuries CE. Numerous similar examples were recovered from Jalame (Johnson 1988:219–221, Fig. 7-55:842). The rest of the pottery was collected from the tops of walls and the bedrock surface in both excavation areas. These included bowls, both imported and local, cooking ware and a lid. Two burnished bowls belong to the Late Roman Ware C type: an LRC2 bowl (Fig. 7:9), from around 400 CE, and an LRC3 bowl (Fig. 7:10) from 460–490 CE (Hayes 1972:327–328, 337, Figs. 66:2; 76:7, 9). One of the local bowls worth noting (Fig. 7:11) is of the Kefar Hananya E1 type, which dates from the mid-third–early fifth centuries CE. The cooking ware included a casserole with a hook rim (Fig. 7:12)—an evolution of the earlier small bowls (Fig. 7:2, 3)—which was very common throughout the northern sites in the fourth–mid-fifth centuries CE, and a cooking pot with a grooved rim for a lid (Fig. 7:13) that is common at Galilean sites such as Jalame and Kefar Nahum, where it was dated to the Byzantine period (Johnson 1988:195, Fig. 7-39:589; Loffreda 2008:191–192, DG 176, Tipo PENT 16). This assemblage also included a bell-shaped lid (Fig. 7:14) that may have served to cover a jar; it appeared early in the Byzantine period. The excavation unearthed remains that indicate the existence of a single building, possibly with a boundary wall to its west. Raban interpreted the architectural remains he uncovered below Bet She‘arim as part of a small farm. The farmland and other buildings to the east of the area may have belonged to one complex. The finds from the Roman and Byzantine periods recovered near the walls are consistent with Raban’s dating of the pottery collected during the survey. It is difficult to attribute the remains to any of the nearby sites. The nineteenth-century British survey map places the spring of ‘En ‘Ami’el (Ain Hamadeh) at the foot of a hill extending north beyond the current route of Highway 75 and higher than the areas farmed in the valley. The hill was leveled in the 1930s and 1940s, probably to create farmland for settlements established in the valley; these fields belong now to Sede Ya‘aqov. The hill probably contained an ancient settlement whose traces were unearthed in the current excavation. Balouka M. 2013. Roman Pottery. In E.M. and C.L. eds. Sepphoris I: The Pottery from Ancient Sepphoris. Winona Lake. Pp. 13–129. Johnson B.L. 1988. The Pottery. In G.D. Weinberg ed. 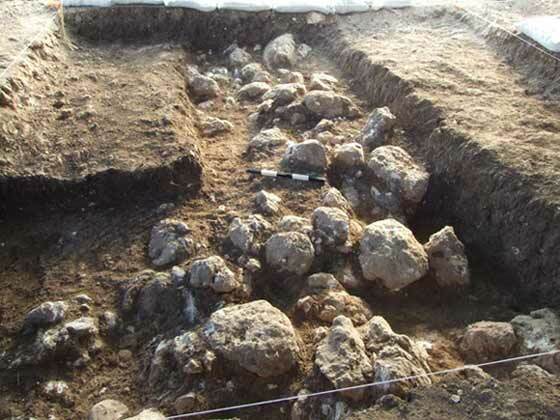 Excavations at Jalame: Site of a Glass Factory in Late Roman Palestine. Columbia, Mo. Pp. 137–226. Loffreda S. 2008. Cafarnao VI: Tipologie e contesti stratigrafici della ceramica (1968–2003) (SBF Collectio Maior 48). Jerusalem. Raban A. 1982. 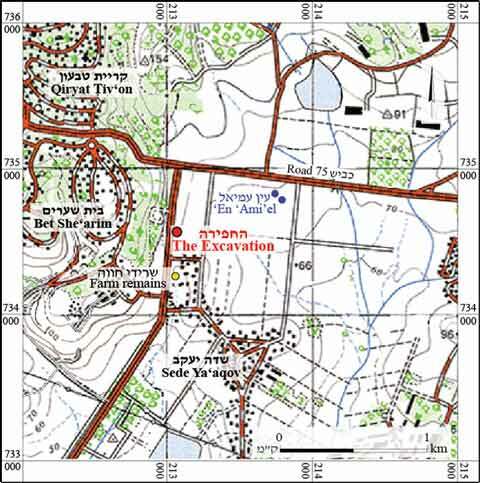 Nahalal Map (28) 16–23 (Archaeological Survey of Israel). Jerusalem. 3. Wall 104, looking north. 4. Wall 102, looking west. 5. Wall 103, looking west. 6. Locus 109, looking south.